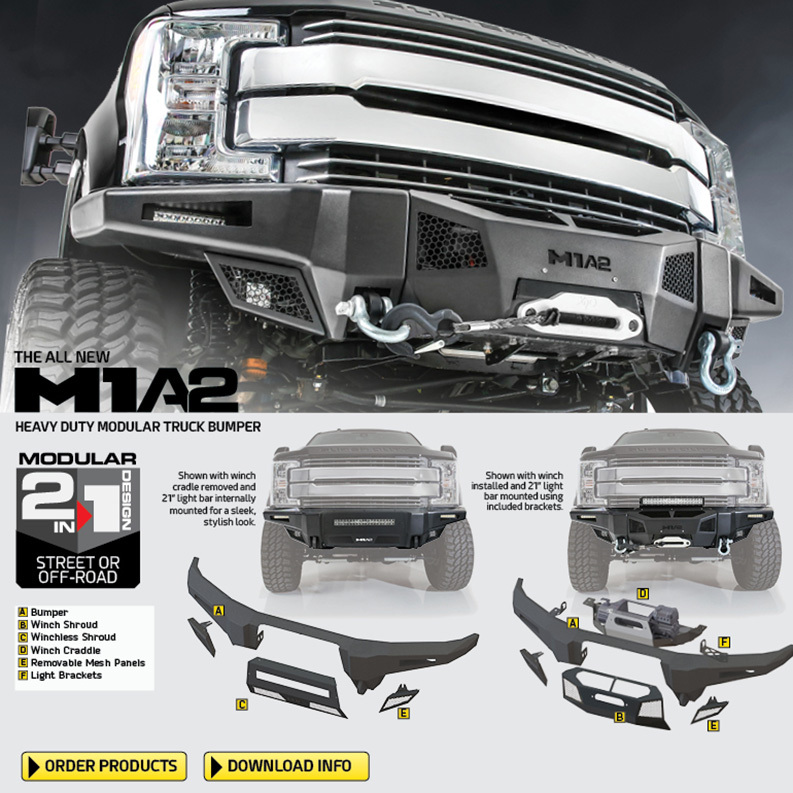 Smittybilt M1A2 Modular Truck Bumper 2009-18 Dodge Ram Smittybilt M1A2 Modular Front Truck Bumper 2009-18 Dodge Ram, Smittybilt M1A2 Front Truck Bumper 2009-18 Dodge Ram, Smittybilt 2009-18 Dodge Ram Front Bumper, M1A2 Front Truck Bumper 2009-18 Dodge Ram, 2009-18 Dodge Ram Front Bumper, Front Offroad Bumper [Smittybilt 612908 Ram Fr Bumper] - $1,419.99 : 3rd Strike Performance, Your Source for Late Model MOPAR Performance Parts and Accessories! The all new Smittybilt M1A2 Heavy Duty Modular Truck Bumper gives you full control to transform your truck – depending on whether you want to conquer the toughest trails or simply make heads turn. The powerful, 1/8" steel bumper is smart engineered for both strength and weight savings and the lower panels can be removed for better approach angles and tire clearance. The blazing 21" LED center light bar can be installed above your bumper to light up the darkest roads. Once off the trails, the modular design allows you to take out the winch and plate, without removal of the bumper, and install the main light bar inside the winch cavity, giving it a sleek, stylish display that will be the envy of any urbanite.